Bowen Mountain Park | The meeting place for the Bowen Mountain community. 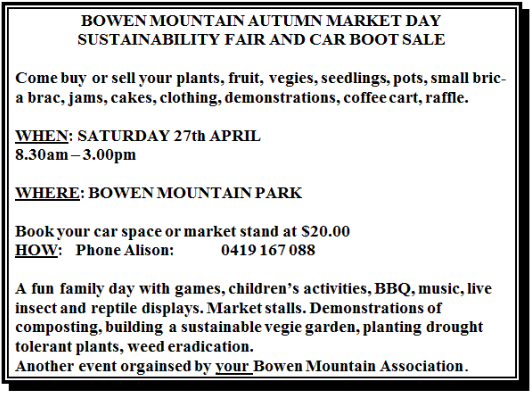 The Bowen Mountain Association regrets to inform you that due to a recent combination of unforeseen events, we have had to make the difficult decision to cancel the Market Day and Sustainability Fair on Saturday April 27th 2019. We intend to run the popular Fair in late March / early April 2020 and are now taking preliminary bookings. We hope that you will be able to participate at that time. We apologise for any inconvenience that this cancellation may cause which has been beyond our control. We look forward to welcoming you to the Market Day and Sustainability Fair in 2020. Bowen Mountain Park Swimming Pool. Filled in with sand ~1986. Any additional information or photos please forward to bowenmountainpark@gmail.com. This photo from Neil Hartley’s album. Bowen Mountain is a ridge top settlement of more than 500 homes and about 1,600 people of all ages. It is located in the Hawkesbury Local Government Authority (LGA), 80 kms north west of Sydney with access roads via Grose Vale and Kurrajong. The roads are are approximately 3 kms long north to south at an average elevation of 400 metres. 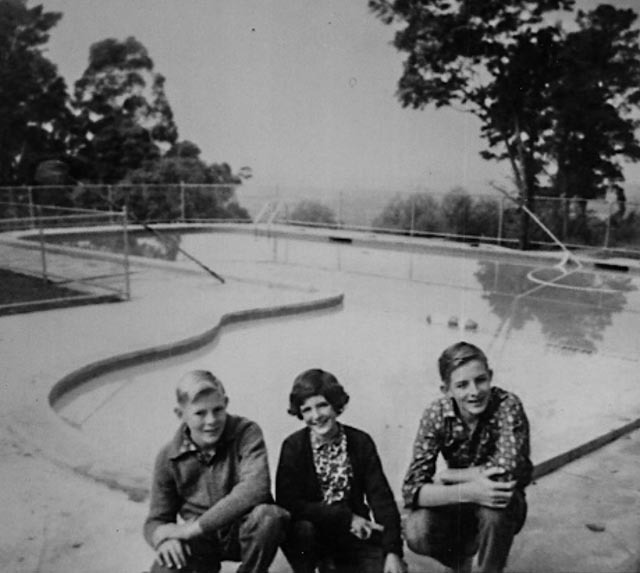 At the northern end of Lt Bowen Road Bowen Mountain is home to the Crago Observatory operated by the Astronomical Society of NSW There are no shops or cafes at Bowen Mountain, the closest are at Kurrajong and Grose Vale with a supermarket at North Richmond. Bowen Mountain Park overlooks the Macquarie Towns of Richmond and Windsor and is central to the surrounding Bowen Mountain area. The park has stands of native & exotic trees and offers panoramic views across the coastal plain. The park is available for picnics with electric BBQ facilities and toilets. The community building can be hired for private functions. The Bowen Mountain Park Management Committee (BMPMC) is a committee delegated by Hawkesbury City Council with authority to maintain and upgrade the park. The volunteers on the committee also administer the hiring of the community Building. See the website for the calendar showing availability, conditions of hiring and contact details for hiring the Community Building.